Hard to find 45mm Fiber Optic, Cat's Eye Eggs. These stunning Cat's Eye crystal eggs are available in 8 vibrant colors and can be used as Feng Shui tools to clear negative energy and increase the positive Chi energy in dark rooms and corners. Each comes with it's own oriental wood stand. 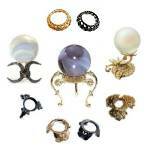 See Cat's Eye Eggs in all 7 jewel colors. These hand carved and polished Bloodstone eggs are a deep green with the beautiful red markings that identify Bloodstone. It has been used as a powerful healing stone, with wonderful grounding and balancing properties, by many cultures since ancient times. Bloodstone is also known as Heliotrope. These high quality Bloodstone eggs are from India and contain small "drops" of Red Jasper. The Walnut Finish Egg Stand is included. Superb hand carved and polished Calligraphy Stone Eggs from India, named in the West for the eye catching, intricate red swirls that resemble artistic calligraphy. Also called Sang E Mariam Holy Stone in the Middle East. This stone is found in the Holy Land as well as India and Persia. It's name means Mary's Stone and the legend is that Mary gave birth while laying on this rock. The Walnut Finish Oriental Stand is included. Rare Blue Calcite Eggs have beautiful sky blue hues! Calcite is said to heighten cosmic awareness and enhance study. Calcite crystals are highly bi-reflective, that means light is reflected in two different directions. The Walnut Finish Oriental Stand is included. These superb Clear Calcite Eggs have good clarity and radiate rainbows in the light. Calcite crystals are highly bi-reflective, that means light is reflected in two different directions. This property gives Calcite a semi-translucent sheen with sparkling reflections. Calcite is said to increase the awareness and integration with the life force. Excellent polish with no cracks, each 2" Clear Calcite egg comes with a Walnut Finish Oriental Stand. Hand carved and polished India Carnelian Eggs have orange and red hues within a creamy agate matrix. Carnelian is believed to protect against envy, fear and rage and helps to banish sorrow from the emotions. Madagascar Carnelian is prized for it's rich flame-colored hues. The Walnut Finish Egg Stand is included. AA Madagascar Blue Celestite Geode eggs have beautifully formed prismatic crystals. Celestite is greatly sought after as a spiritual stone, said to facilitate higher meditation, cleanse negative energies in one's surroundings and increase sensitivity to the higher self and angel guardians. The Oriental Rosewood Stand is included. 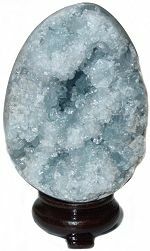 AA Madagascar Blue Celestite Geode 4" H and larger eggs have large beautifully formed prismatic crystals. Celestite is greatly sought after as a spiritual stone, said to facilitate higher meditation, cleanse negative energies in one's surroundings and increase sensitivity to the higher self and angel guardians. Get these great specimens before they're gone!! The Oriental Rosewood Stand is included. Chrysocolla crystals are usually intergrown with quartz and opal. It has a bright bluish green appearance with occasional copper patches. Chrysocolla is said to eliminate negativity in the home or environment as well as having healing properties. This Peruvian gemstone is fast disappearing from the market as the high quality mines have been depleted! The Walnut Finish Oriental Stand is included. Extra quality, deep dark blue AA Dumortierite large 60mm eggs from India, the best source for this rare stone. Dumortierite, named after it's discoverer, is used to ground high strung temperaments, it softens stubbornness while increasing self reliance and is considered a stone of patience by crystal masters and healers. The Walnut Finish Oriental Stand is included. Bring home a bright sunny day with these gorgeous Orange Calcite Eggs from Mexico. Calcite crystals are highly bi-reflective, that means light is reflected in two different directions. This property gives Calcite a semi-translucent sheen with sparkling reflections. The Walnut Finish Oriental Stand is included. Fluorescent in UV light, Mangano Pink Calcite also has a breathtaking semi-translucent pink glow in sunlight! This fast disappearing stone from Peru, has beautiful banded variations of intense to very pale pink formations. These eggs have a fine, smooth polish and come with a Walnut Finish Oriental Stand. Shiny bright Yellow Calcite Eggs from Mexico. In Gem Lore, Calcite facilitates heightened awareness and an appreciation of the creative forces or Chi energy. Yellow symbolizes the energy of the mind. Excellent polish with no cracks, each 2" Yellow Calcite egg comes with a Walnut Finish Oriental Stand.